The change the Whitlam Government enacted in the area of healthcare was transformative. 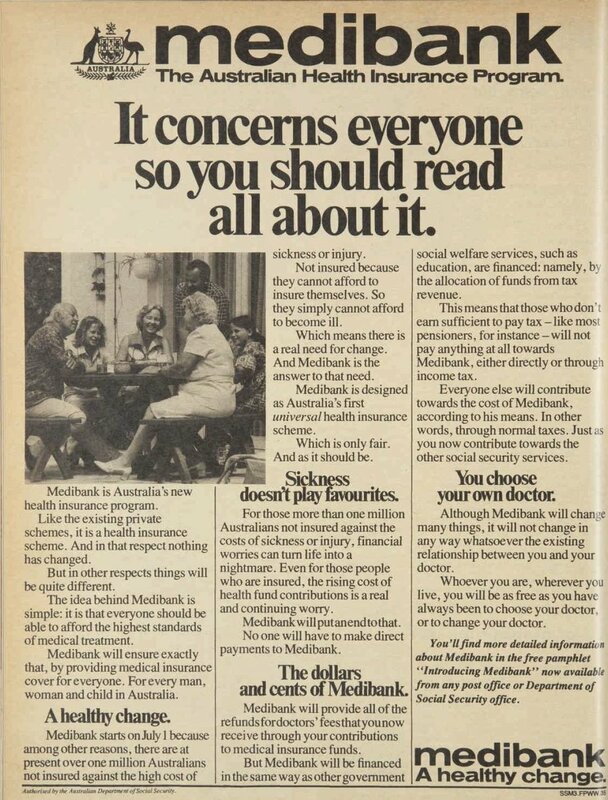 The introduction of a universal healthcare system – Medibank was one of the reforms that defined the Whitlam Government and its underlying philosophy. The guiding mission was to provide adequate healthcare to all citizens regardless of their financial means. In his 1972 election campaign speech, Whitlam stated: ‘I personally find quite unacceptable a system whereby the man who drives my Commonwealth car in Sydney pays twice as much for the same family cover as I have, not despite the fact that my income is 4 or 5 times higher than his, but precisely because of my higher income’. The Whitlam Government sought to ensure that Australia’s social security system provided an adequate safety net for those in most need, and that the system took account of social reality. The Whitlam Government enacted changes to support the opportunities and security of women, in particular. The primary achievement of the Whitlam Government in health was the creation of Medibank, Australia’s national health insurance system. The system would provide free access to hospitals and a range of other medical services. The maximum gap between a doctor’s fee and the Medibank rebate was to be $5. Medibank was designed to provide health coverage for the 17% of Australians who did not have, or could not afford private health insurance. Before Medibank, the government provided tax concessions to encourage adoption of private health insurance. However, these arrangements were grossly inequitable, with high income earners paying less than low income earners for the same health insurance coverage. The introduction of the system was met with ferocious opposition from many in the medical profession, the General Practitioners’ Society, the Australian Medical Association and the private health funds. Opponents argued that the system constituted a socialist takeover, and that the freedom of Australian citizens was at stake. Some doctors opposed the reforms because of their concerns that the system would reduce their income. The legislation enabling the reform, the Health Insurance Commission Bill and the Health Insurance Bill did not enjoy an easy passage through parliament. These bills were repeatedly blocked by the Senate, and only became law once a double dissolution election in May 1974, and a joint sitting of the Parliament was held in July – the first such sitting in Australian history. Agreements with state governments were then negotiated to integrate their hospitals into the system, though these negotiations were also protracted and difficult. The Medibank system began operation on October 1, 1975. Although the Fraser Government repealed elements of the Medibank system, it was largely restored again as the Medicare system we know today, after the defeat of the Fraser Government (1975-1983) by the Hawke-led Labor Party in 1983. The Whitlam Government committed significant funding to the construction of new hospital facilities, which were particularly lacking in the rapidly expanding outer suburban areas of Australia’s cities. Over $140 million was allocated to the development of hospitals throughout Australia between 1972 and 1975, part of which included a seeding grant for the construction of Westmead hospital in the western Sydney region. To complement the establishment and expansion of hospitals, the Whitlam Government launched the Community Health Program in 1973. Through this scheme, $120 million was allocated to the construction of new facilities such as community health centres, and the provision of community services such as community nurses, women’s refuges, rehabilitation teams, and services for geriatric patients. Associated with this program was additional funding to state governments to provide alcohol and drug rehabilitation services, and mental health services. From its first budget, the Whitlam Government raised social security payments across the board. Aged and invalid pensions, widow’s pensions, unemployment benefits and sickness benefits were all raised significantly, and the means test was abolished for those aged over 70 on the age pension. These changes led to a substantial improvement of the financial position of welfare beneficiaries. Whilst these increases should be viewed within the context of the level of inflation in the economy at the time, they do constitute a significant increase in real terms. 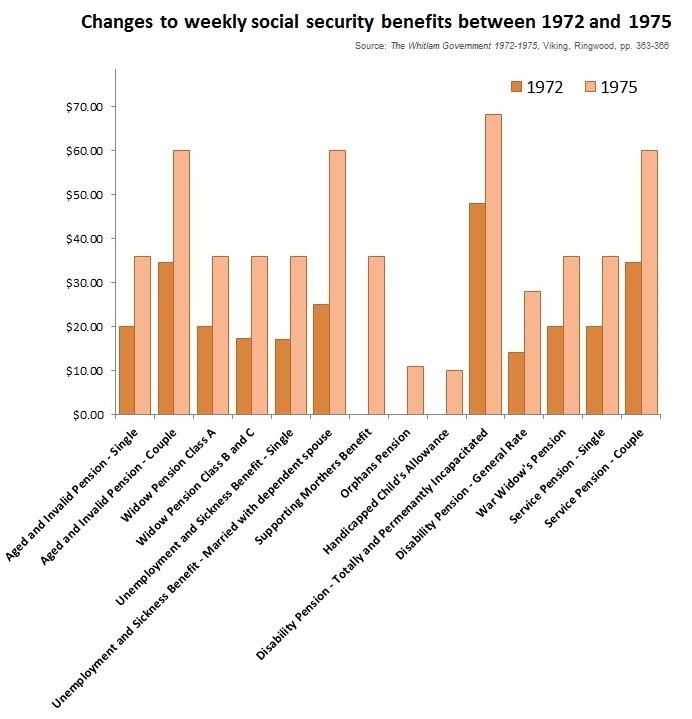 The Whitlam Government also enacted reforms to create four new social security benefits. These included the Supporting Mother’s Benefit for single mothers, the benefit payable to ‘lone fathers’, the Double Orphans’ Pension payable to the guardian of a child who had lost both parents and the Handicapped Children’s Allowance to guardians of severely disabled children. The Social Security Appeals Tribunal was created to provide an independent forum for welfare recipients to appeal decisions made by the government’s social security agencies. The subsidy for non-profit aged care providers was doubled from two dollars for every dollar spent to four dollars for every dollar spent. Subsidies for home carers and housekeepers for aged people were also doubled. The Whitlam Government also passed the Handicapped Persons’ Assistance Act which provided increased funding for volunteer organisations providing support services and employment to people with developmental disabilities, and increased subsidies for some of their staff. The Government favoured this model of support because, as Social Security Bill Hayden argued, “voluntary organisations haven an individual touch. They can deal with the person as a whole”. Funding was improved for services provided to homeless people. The Homeless Persons’ Assistance Act 1974 provided funds for the upgrading of accommodation centres for homeless people, for the provision of meals and accommodation, and for the increased subsidy of social workers’ salaries. In 1973, the Whitlam Government launched the Australian Assistance Plan, which was a program of funding social welfare services at the grassroots level. Funding administered by 37 regional councils, who allocated the priorities and made decisions as to how money could be best spent. The funding was distributed to community centres, volunteer groups, resource centres, and programs designed to provide assistance to support people with specific needs, including women, children, young people, disabled people, the elderly, and new migrants. This new model of delivering social welfare services was praised by organisations such as the Australian Council of Social Services which supported the power it gave to grassroots organisations, and the promotion of community participation in the delivery of social services. The Whitlam Government enacted the States Grants (Housing Assistance) Act and the Housing Agreement Act. Together, these provided a significant boost in funding to state government bodies responsible for the construction of new homes for low income earners. In 1974-75, the construction of 13,500 homes was funded, and this increased supply meant that waiting times for applicants to access to this housing were substantially reduced.